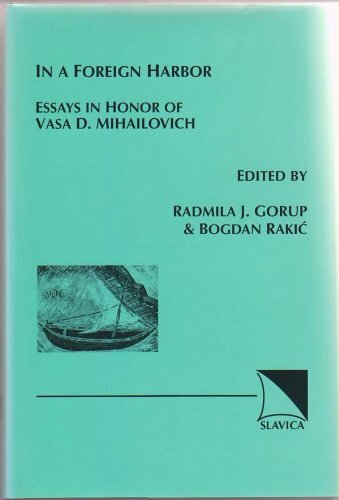 The texts published in this collection, ranging from poetry in Professor Vasa D. Mihailovich's native Serbian language to essays dealing with literary works written in and about exile, from works on traditional Serbian poetry to studies on the Serbian language and poetry in English translation, amply illustrate the wide range of literary activities in which Mihailovich has himself participated over the last 45 years. The contributors include some of the most distinguished authors and critics from Serbia, as well as literary scholars and linguists from the U.S. and Great Britain. In a way, this volume symbolically bridges the gap between two languages and cultures, Serbian and Anglo-American, to both of which Professor Mihailovich rightfully belongs, as well as between his homeland and the country of his adoption. Radmila J. Gorup earned her Ph.D. from Columbia University. She has taught South Slavic Literatures and Languages at the University of California at Berkeley and at Columbia University. She published a study on the semantic organization of the Serbo-Croatian verb and edited The Prince of Fire: An Anthology of Contemporary Serbian Short Stories. She has served as a guest editor of an issue of the Review of Contemporary Fiction dedicated to Milorad Pavic. She has also served as President of the North American Society for Serbian Studies. Bogdan Rakiç has taught English, American, and South Slavic Literatures at the University of Sarajevo, Indiana University, and Franklin College. He is the editor-in-chief of the journal Serbian Studies and the editor of the English version of Milos Crnjanski's The Novel of London in the Complete Works of Milos Crnjanski. His translations into Serbian include the works of Joseph Conrad, Henry James, and Gabriel Okara; and he has also translated the works of Ivo Andric, Mesa Selimovic, and Borislav Pekic into English. ABOUT THIS VOLUME: The texts published in this collection, ranging from poetry in Professor Vasa D. Mihailovich's native Serbian language to essays dealing with literary works written in and about exile, from works on traditional Serbian poetry to studies on the Serbian language and poetry in English translation, amply illustrate with wide range of literary activities in which Mihailovich has himself participated over the last forty-five years. The contributors include some of the most distinguished authors and critics from Serbia, as well as literary scholars and linguists from the U.S. and Great Britain. In a way, this volume symbolically bridges the gap between two languages and cultures, Serbian and Anglo-American, to both of which Professor Mihailovich rightfully belongs, as well as between his homeland and the country of his adoption.